What is the status of rehabilitation in the Sardar Sarovar project? 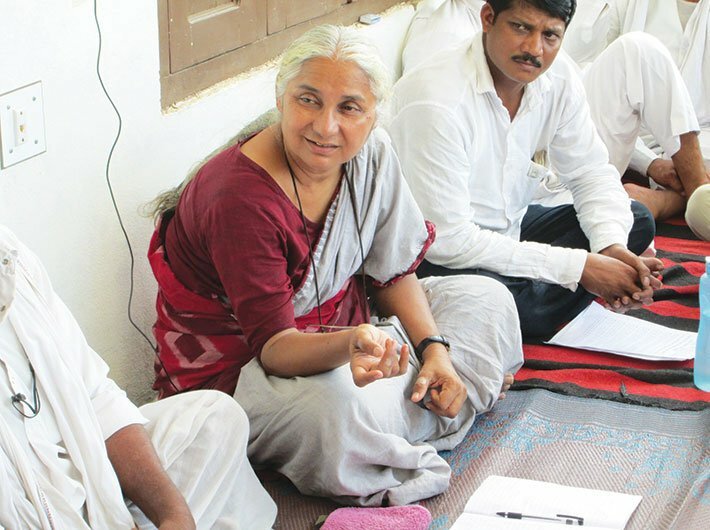 The declared number of project affected people (PAPs) by NWDT (Narmada water disputes tribunal) is 51,000 families in the three states as per the 1991 census. There have been two censuses after that – 2001 and 2011. With every census, there is a 20% increase in rural count. Even if you take the 2001 census, the number of PAPs is about 63,000 families by our estimates. Of these, at least 50,000 families are from Madhya Pradesh. Out of that, according to our estimates only 3,000-4,000 families have built a house on the resettlement site. However, this does not mean they live in these resettlement sites because these sites have many problems. A maximum of 400 families have gone to live in the resettlement sites in Madhya Pradesh. At least 1,500 families in Gujarat and Maharashtra are yet to get land for land. Only 30 families in MP have got land for land. It is such a shameful scenario! Apart from that there are at least 7,000-8,000 families in MP who fall under the category of the landless but whose livelihood has been affected. According to the action plan of MP government, they are entitled to compensation but nothing has been given. So the government has created a peculiar situation where land has been acquired but there is no rehabilitation. There is no irrigable land near the resettlement sites, so the people can’t even move to the resettlement sites. If you see the action plan, it is a beautiful document with compensation for every category of people from landless non-agricultural to major sons. They had written this only to make the supreme court (SC) and the World Bank happy. Where is occupational rehabilitation of people who have lost their livelihoods? A special fund was to be created for the landless PAPs with joint accounts between the landless and the government. This would have ensured that cash compensation is not wasted. Exactly the opposite has happened. The general perception has come to be that anti-dam is anti-development. How do you respond? General VK Singh has protested against a nuclear power plant, Jual Oram is against POSCO and many such ministers have rallied against projects but only when they were in the opposition. But nobody calls them anti-national and anti-progress. I reiterate that we are not saying ‘no dam’. What has happened has happened. We just want that so many people should not become homeless and destitute because of the dam. What kind of progress is that? The height of the dam is inseparably linked to the rehabilitation of the people. This is the SC judgment. In 2006, when we were on a fast and arrested at the All India Institute of Medical Sciences, Delhi, Manmohan Singh on April 17 assured the SC in writing that before the dam reaches 122 m, all rehabilitation work will be finished. The NWDT award stipulates that irrigable lands and house sites were required to be made available to PAPs one year in advance of the submergence and requisite amenities also to be provided. In 2005, the SC ruled that submergence will not be permitted unless rehabilitation programme is carried out. Modi’s decision is a clear contempt of court. Was (water resources minister) Uma Bharati involved in this decision? Was (environment minister) Prakash Javadekar involved? If yes, then they have not considered the fishermen, labourers, the shopkeepers of MP. And if they weren’t involved in the decision, then it speaks a lot about Modi-ji’s good governance and development model and the good days that he has promised which entails not listening to anybody. What about the benefits of the SSP? The SSP was touted as a project which will irrigate 18 lakh hectares. How is it then that (Gujarat CM) Anandiben Patel now says that after attaining the full height, only 6.5 lakh hectares are going to get irrigated? There is talk to denotify 4 lakh ha of land and 70,000 ha has already been denotified [from irrigation]. Obviously, the water is being diverted to industrialists. Only 20% of the water supplied by the SSP at its present height is being used by Gujarat. The canals and the sub-canals are not ready yet. What is the need for increasing the height of the dam any further? The Gujarat farmers are not demanding anything. It is the industrialists who have helped Modi-ji in the elections. Such behaviour is befitting of Gujarat CM but not the PM of the country. When Modi-ji had come for campaigning he had told the people at Anjad [in MP], “Give me 9 metres more [then the dam height was 100 m] and I will make MP shine. Where is MP shining? This time he had come during the campaigning but did not mention the Narmada issue even once. If the Ganga is pure, is the Narmada any less pure? It is said that you attain moksha by taking a dip in the Ganga but you attain moksha only by looking at the Narmada. Impoverishing so many people and making them unemployed cannot be justified by any law or any code of ethics. It is unacceptable. This is the first decision of the new government vis-à-vis development projects. Is this the form that development is going to take? What was the need to call an emergency meeting to decide on a project in such haste; a project which has the most paraphernalia, number of affidavits, judgments, details, GRAs? Where did the government get the time to look into everything and consult the various stakeholders before taking a decision? Why has the government hurried with this decision without complying with the legal and judicial stipulations on environmental safeguards and rehabilitation of lakhs of people? With '90,000 crores as estimated final cost of the project, have claims of benefits on irrigation and power actually been realised? In the last 30 years of SSP, 13 of which was Modi’s rule, why has the canal work been languishing behind so much? We are going to fight this decision. Just like an emergency meeting was taken to make this decision, I demand an emergency meeting with the PM. I have already written to him and all the ministers concerned. We are still hopeful. Whatever has happened is a known story. Further injustice should not be done. There should be a comprehensive, participatory assessment of SSP, including status of rehabilitation and benefits and environmental compliance as per law. A win-win situation is imperative and possible.